Inside Sales team is assigned specific geographical territories to quickly become familiar with our customers' special needs and requirements. This means you'll speak with the same Sales Engineer every time and consequently, you can depend on getting sales assistance based on your needs. Our sales team, all with hands-on, in-house production experience and field application knowledge, can provide you with information about our products and their process applications, as well as help you select a standard or special product to solve your specific problem. They are your partners and your first link to the successful application and use of our products. Temperature Range (-100 to 660 C) Liquid baths are a temperature measurement and calibration tool used for immersing products and immediately exposing them to a very specific temperature. Liquid baths are often used for the calibration of temperature measuring devices such as thermometers, sensors, thermocouples and various other products. Need the most accurate thermocouple calibrations possible? 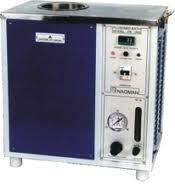 The Thermocouple Furnace gives you a broad temperature range to 1200 °C, and stability up to 0.05 ?C. Alternative calibration tools such as a sand bath or fluidized alumina bath have been used for calibrations up to 700 ?C but with very poor comparative performance. Gradients of several degrees are common in a sand bath, along with poor stability, resulting in low-accuracy calibrations.